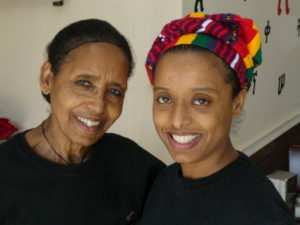 Enat’s owner Tina Tedla (right) with her mother Beke Alemu. Bite into an Ethiopian sandwich at Enat, a recently-opened Ethiopian restaurant on The Plaza at Eastway, and you are sinking your teeth into tradition and change. It’s a darn good sandwich. Beef chunks in a rich tomato-onion sauce are ladled into a toasted hoagie roll, which sops up the gooey goodness of the gravy. Ask for it with spicy pepper slices or without. 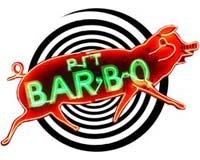 You won’t find anything like it elsewhere in Charlotte. Nor will you likely find anything like it in Ethiopia. You see, in a new land, newcomers find joy in traditional foods from back home. But in a new land, traditions also change as they bump up against fresh opportunities and challenges. 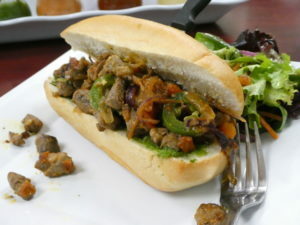 Enat puts traditional Ethiopian tibs — meat and gravy — on an American hoagie roll. It comes with salad and an array of condiments to add, if you like. Tina Tedla chose the name Enat for her restaurant because it means “mother” — both the motherland of Africa and also her own mother Beke Alemu, whose recipes she follows and who helps out in the kitchen. Mother Alemu cooks the traditional meat-and-gravy dishes called tibs. She dices morsels of meat (lamb, beef, chicken or fish), makes a thick tomato broth seasoned with Ethiopian spices, and cooks everything together slowly for hours. There are also lentil dishes, simmered with the same patience. And vegetables including sautéd cabbage and greens. In most Ethiopian restaurants, all of those get ladled onto a plate covered with a special bread called injera. Made with a grain called teff, it is almost a crepe. You tear off bits and scoop up bites of the meat and vegetables — no knives, forks, or spoons (though Tedla happily provides silverware on request). At Enat, Mother Alemu “makes the injera fresh every morning,” says Tedla proudly. She shows off a mesob, the table of woven basketry where Ethiopians traditionally linger over a meal. But in this new land, new realities arise. Many east Africans drive taxis in Charlotte. The work puts a premium on staying behind the wheel — no lingering. “The taxi drivers wanted something to go, so we started making the sandwiches,” Tedla explains. 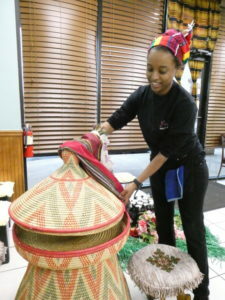 Owner Tina Tedla shows off a traditional Ethiopian mesab at Enat.